SEOUL, Oct. 16 (Yonhap) -- Prosecutors launched an investigation Monday into allegations that former President Lee Myung-bak used his presidential power to help his brother's firm recoup a lost investment before others. 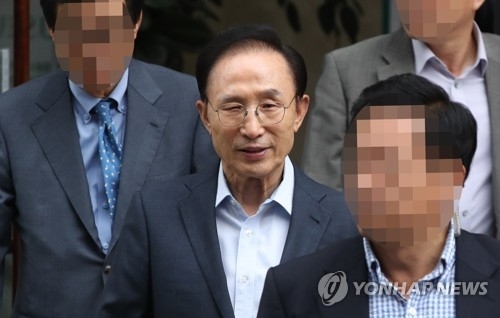 The head of a local firm, Optional Capital, filed the allegations with the prosecution last week, claiming that Lee abused his powers to help the brother's firm, DAS, recover about 14 billion won of investment from a convicted Korean-American businessman, Kim Kyoung-joon. The firm's head, identified only by his surname Chang, claimed that the money was supposed to go to his company as it was certain to win a lawsuit to recover the lost investment from Kim, but the money ended up going to DAS because of Lee's interference. On Monday, the case was assigned to a high-tech crime department at the Seoul Central Prosecutor's Office. The investigation draws attention because it could lead to the reopening of a high-profile stock manipulation case involving Kim's investment firm "BBK," which has long dogged Lee, even before his 2007 election as president. The allegations at the time had it that Kim rigged the stock price of Optional Ventures, a subsidiary of BBK, pocketed millions of dollars in ill-gotten profits and embezzled hundreds of billions of won in company money in the early 2000s. Kim was convicted and sentenced to prison. During the 2007 election campaign, Lee had been alleged to be the real owner of BBK, but a prosecution investigation at the time found no evidence backing up the allegations.